Since the biblical serpent enticed Eve to take a bite out of the apple from the Tree of Knowledge, eating has been regarded as a potentially sinful activity. By performing a close reading of the visual rhetoric in a series of “sponsored” ads that have shown up in my Facebook news feed lately I may be stretching the meaning of “literary food writing;” however I could not let this opportunity pass since the images featured literally inscribe the message onto the food items depicted via a name tag bearing the words: “HELLO. My name is Meningitis.” Written text conveying information about meningitis frames the photographs in the style of a status update, yet the eye is inevitably drawn to the image of unknown young people having fun together. The photos portray the common junk food we all occasionally indulge in as a sinister carrier of disease via the name tag, so my immediate reaction the multi-modal message—image and text working together as one—was revulsion. The second level at which the ad works is to promote a sense of paranoia, since it’s the very closeness to one’s peers, the social intimacy of the situations depicted in the images including going to the movies, drinking at a party, or sharing an ice cream cone with a special someone on a hot day, as uncannily fraught intimate encounters with someone else’s germs. If our friends, lovers, and acquaintances can transmit such a powerful pathogen to us unawares, what hope is there of meaningful social interaction? 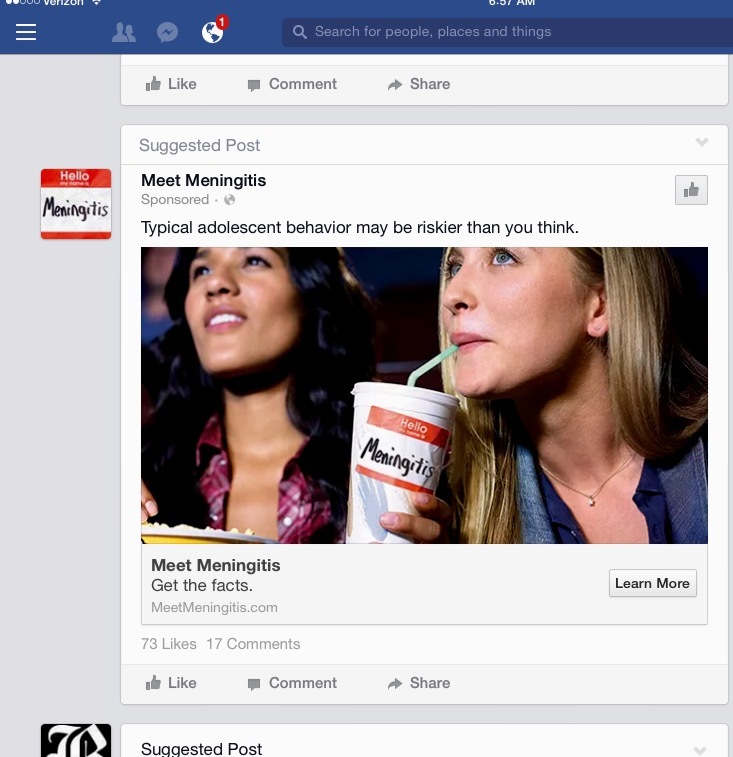 No wonder these ads are produced for the simulated environment of social media. On the face of it, the campaign’s goals appear to be noble enough: raising awareness about this serious illness by highlighting the risky “typical adolescent and young adult behaviors” which can promote the spread of meningococcal disease. Chief among these risky behaviors, the photo campaign which peppers my Facebook newsfeed suggests, is communal eating or, more specifically, the sharing of specific food items like beverages and snack foods, which can entail the transmission of saliva from one person to another. 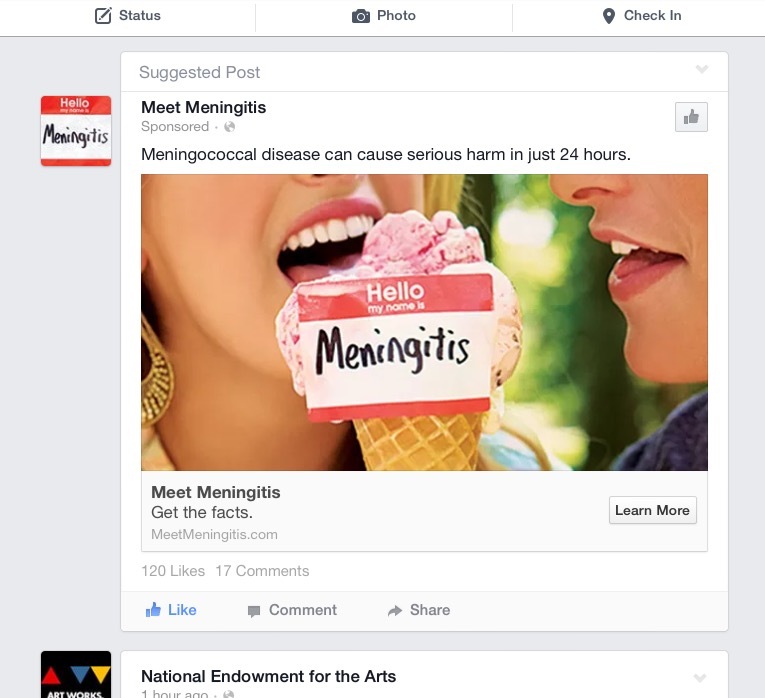 The campaign’s official website, MeetMeningitis.com, provides a broader context through which to understand the images by mentioning the other two types of activities which can lead to the unwitting transmission of this disease: “closed-quartered living and group hangouts” and “kissing.” Despite being relatively easy to depict visually, kissing is not an activity depicted in my newsfeed, perhaps to avoid entering into hot-button issues about how to properly depict sexual attraction. Any conceivable configurations of kissing couples could be open to charges of either heteronormativity or homophobia. The ice cream image is the only one featuring a mixed gender couple, thereby rendering the co-eating involved in consuming this frozen confection into a visual metaphor for other intimate contact, such as “kissing” or sexual activity. 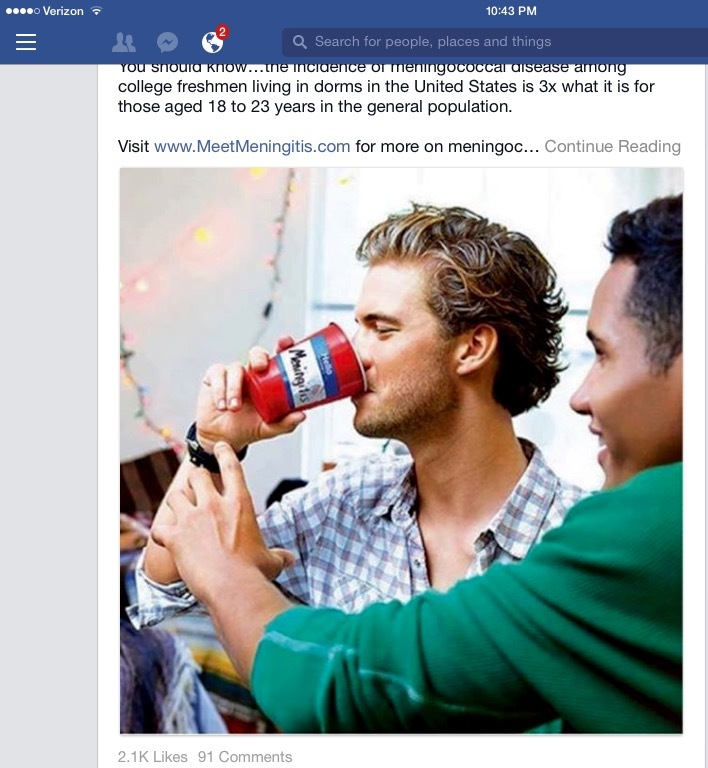 So, the logic of these ads is to posit what I am calling the “public intimacy” of young people eating informally together as dangerous precisely because these behaviors rely on the assumption that the parties involved know enough about one another to be close. The name tag suggests that this type of intimacy belies a darker truth, one in which some parties involved are silent carriers of the bacteria that carries meningitis. Transmission takes place through the ingestion of the contaminated substance—licking the ice cream, drinking soda through an infected straw or sharing a plastic cup of beer at a frat party—and thus it’s very hard to trace. Usually, one of the benefits of sharing a meal with others is to establish and affirm close social bonds. However, this website would have us (and by us I think they mean parents of teenagers and young adults) discourage such behavior in our offspring. So, any social media user repeatedly subjected to this type of “sponsored content” might pause to wonder, who is raising this alarm? Is it the medical community? The CDC? Is the goal to promote the vaccination of people in this age group against meningitis in the wake of the recent measles outbreak? Well the answer to the last two questions is a resounding no, despite the fact that there is both a vaccine available and the CDC does make information on it accessible via its own website. Advertising on Facebook costs a pretty penny, so the motives behind this campaign have to be more than altruistic. Only by scrolling all the way down to the bottom of the MeetMeningitis.com site does the corporate sponsorship of this entire consciousness-raising campaign become clear—Pfizer Inc. is peddling a “prescription product option” for those interested in receiving more information about the disease. Rather than lambast this pharmaceutical company for their reprehensible scare tactics, which enact the bait and switch logic of making viewers paranoid about contracting a terrible illness only to peddle their own medication for it, what I’d like to focus on is a different question: Why is food imagery considered to be the most effective way of communicating the message of disease awareness and prevention? Despite the importance of healthful eating patterns in adolescence, adolescent lifestyles, influenced by the desire to fit social norms, may not be conducive to encourage teens to eat in a manner that meets the increased and changing nutrition needs during this period. Furthermore, a lack of a sense of urgency regarding future health may make nutrition a low concern among adolescent. “Safe fraternizing,” though not a catchy phrase, would better convey that the danger lies in the transmission of bodily fluids—saliva—during a whole host of behaviors rather than being inherent in food itself. Thus, a whole host of communal activities such as sharing straws, cups, or make up, would come under scrutiny, rather than literally labeling food as unsafe. As a professor, I have met many students who have suffered from meningitis and emerged from the experience with lasting health problems. I support any effort to raise awareness about this potentially life-threatening disease. However, as a food studies scholar, I think it unwise to visually demonize food because doing so contributes to the public discourse which dissociates ingestion from appetite, thereby leading to more disordered eating and its many co-morbidities. Centers for Disease Control and Prevention. “meningococcal Vaccination.” http://www.cdc.gov/vaccines/vpd-vac/mening/default.htm Accessed 2/18/2015. Neumark-Sztainer, Dianne, Mary Story, Cheryl Perry and Mary Anne Casey. “Factors Influencing Food Choices of Adolescents: Findings from Focus-Group Discussions with Adolescents.” Journal of the American Dietetic Association 99.8(1999): 929-937.